The Proteas want a batting all-rounder in the ODI side. There’s no use not using the 20-year-old then. 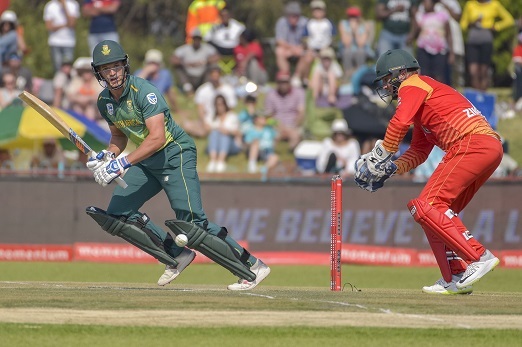 For months now, Proteas skipper Faf du Plessis has made it reasonably clear that the national one-day side needs a batting all-rounder at No 7 to give them the best shot at World Cup glory. He raised the issue again following the weekend’s comprehensive loss to Pakistan in the Pink ODI at the Wanderers. “If we have Lungi Ngidi, Kagiso Rabada and Dale Steyn all in our attack then it’s an option to just play six batsmen. But if one of them is not there, then we need to relook the six-batsmen strategy. It’s pretty obvious to me that we possibly need another batsman or all-rounder,” said Du Plessis. It’s unsurprising then that Wiaan Mulder has been added to South Africa’s squad for the decider against the visitors at Newlands on Wednesday. The five-match series is tied at 2-all. The 20-year-old, who makes no secret of the fact that he wants to become a batting all-rounder in the mould of the legendary Jacques Kallis, is – at least on paper – the Proteas’ best hope of solidifying the batting order. A first-class batting average of 43 attests to that. More importantly, if Mulder has been selected too because he’s performing well at the moment, then he has to play at Newlands. South Africa have already been shown the value of that strategy with Rassie van der Dussen’s good returns in the series to date. Mulder has runs and wickets behind his name since his recovery from an ankle injury. He made 40 against the Titans in Benoni and then prospered to strike a superb, fluent 146 against the Knights in Bloemfontein. Strikingly, his bowling has been a bigger highlight. Mulder played a fine supporting role with a match haul of 4/60 in Durban, before crippling the Titans’ top and middle order with 4/55. If he’s the potential answer to Du Plessis’ prayer, he needs to play immediately.